Our Mission: To provide high quality customer service that is consistently professional. To provide products based upon historical examples that are lightweight, low maintenance at fair prices. 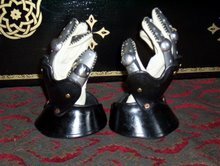 We currently have 10 sets of leather and spring stainless steel finger gauntlets in stock. We have two sizes medium and large. 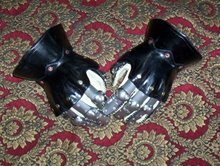 We have attached the metal fingers to high quality leather half gauntlets. 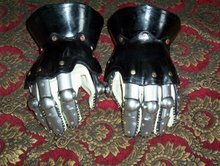 These will be great for spear fighting or use with sword and shield. Pre Pennsic sale price $400.00 plus shipping. Pennsic price will be $500. 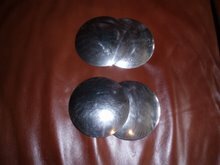 We also have spring stainless finger bucklers in stock at the sale price of $25. Medium and large spring stainless simple shoulders now in stock, sale price $40. Did you know spring stainless is three times stronger than normal stainless? 22 gauge spring stainless is roughly the equivalent of 14 gauge stainless. 1. It is light weight. 5. And finally it looks good. You can spend a great deal of time and money trying different materials, mild steel, titanium and traditional stainless steel. In the end you will not be satisfied as it will either be to heavy, not look correct, not protect, cost too much or be a great effort to keep rust free. This will result in you purchasing more equipment to eliminate one or all of these factors. When you compare all the factors we believe spring stainless steel is the best solution for most armor.We hope that you agree that these new innovative and attractive products are cutting edge blending of historical lines, protection, low maintenance, light weight and fair prices. We hope you see the value in form and function that we are offering. Thank you for visiting Saint Martin’s Armory. 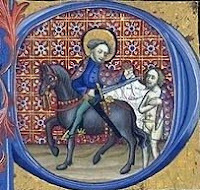 You may or may not know that Saint Martin is the patron Saint for all soldiers. He is known for cutting up his cloak to cloth the poor who were cold or had no clothing. 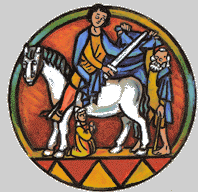 We like Saint Martin saw and feel the need of many who have taken up the noble past time of competing in armored combat. While we are no Saints we do wish to help those who are in need of quality equipment and dependable service. The main reasons we formed Saint Martin's Armoury is that we are tired of people being stolen from. We are 100% reliable. We will never take pre-orders; it is always cash and carry. If it is not in stock then we will not take your money. You buy a product it goes into a box sent to your house or business the next day. No broken promises or excuses that the armor will be finished next week, month, year or never. It is a real simple business concept; you get what you paid for, end of story. It is our desire to see historically accurate armor that also takes into effect reduction of time in maintenance as well as being lightweight and protective. We do not and will not do custom work. 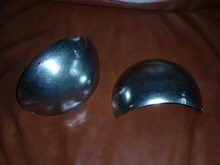 However we will provide you with a high quality piece of armor that will measure up to most standards. When you purchase an item we promise to send you emails with tracking numbers letting you know when your products have shipped. If you call or make an inquiry you receive a return call or message out of general respect. In short Saint Martin's Armory is run by professional business people with over 20 years of business experience.